An avalanche is a huge pile of snow falling down a mountain. It is very dangerous. It can cover a whole village. In North America, 20 to 30 people die in avalanches a year. Avalanches have starting zones, a track, and a run out zone. A snow rescue brings dogs when people are under an avalanche. Avalanches are so powerful that they can cover a whole forest. 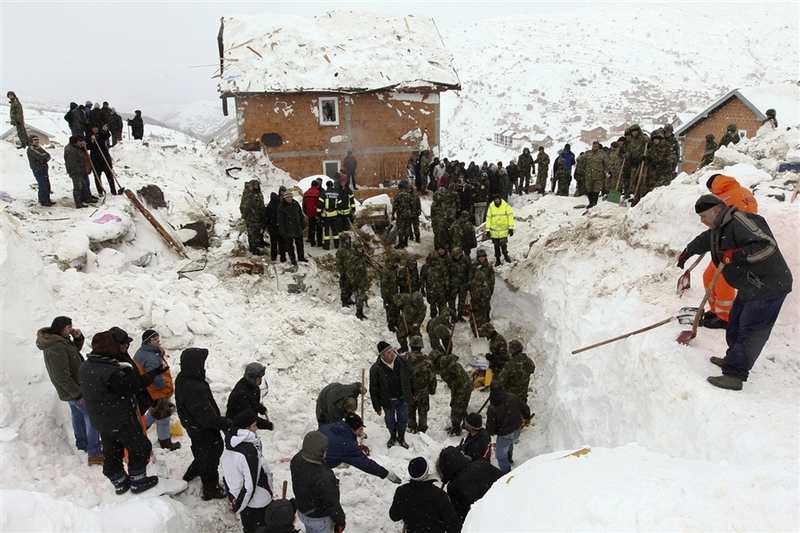 Avalanches have hard snow, that's why it kills people so fast. There are ice avalanches and rock avalanches. Avalanches can reach a speed of 80 miles (130 kilometers per hour). If you are planning to go to a mountain to ski or hike where there can be an avalanche you need to go with somebody. Also, tell family or friends where you are going in case something happens to you. Stick to that area and do not change your plans. You need to bring water and a snack. If you see an avalanche coming towards you, you need to go a safe place to take cover, like a cave or dig a hole in the snow. You need to look at the area and the weather for signs of an avalanche starting. 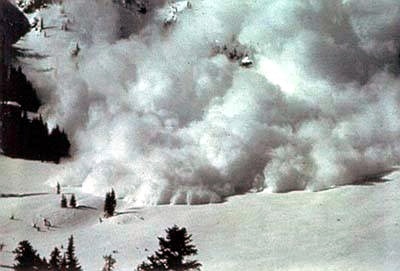 An avalanche can start by skiers, snowboarders, and snowmobiles. So you need to be careful. Try to avoid the avalanche by moving to the side. Try to get to the top of the avalanche by swimming through the snow to the top. If trees are nearby try to grab onto one so you don’t get buried. If you are buried under an avalanche try to make a breathing hole because you don’t have a lot of time to breathe. Dig a big hole in the opening. If you get buried don’t panic! Don’t try to get down the mountain because Avalanches can reach a speed of 80 miles 130 kilometers per hour. Move quickly because the snow gets hard like cement. Put your hands and arms across your face to give you room to breath. Take a large breath so your chest gets bigger and gives you more space. If you are close to the top, reach up break out of the snow. Crawl through the snow if there is a hole. Yell to signal to people you are buried.